Welcome to La isla de Vieques. This site is owned and mantained by a native and resident of this small island. Where to stay in Vieques? Biobay Viques Rentals Offers houses where you cant stay: House / Studios with pool. Ocean View House up 18 people. Beach front Yellow House up to 15 are the best ways to visit us! 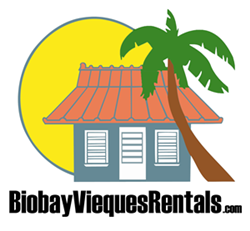 Biobay Vieques Rentals offers amazing houses to spend your holidays. Just clik on the properties to see rates and information. Although Vieques has been named many things lately, Spanish Virgin Island and Green Isle among the new names, these names are not recognized nor accepted by the locals. Internet search rules forces the use of “Island” or “Isla de” but the reality is that the island is named Vieques. Pronounced “Bee-eh-kes” by the locals. To keep up with the Internet game I will use Vieques Island or Isla de Vieques on this website. Visit vieques and stay in our Guest house in Vieques from only $65 a night. Vieques is not like any other island in the Caribbean. Most of its land is undeveloped due to the presence of the US Navy for over 60 years. The Navy had posession of 2/3 of the total land. As a result most of the beaches are located in undeveloped areas. In 2003 the Navy passed control of most of this land to the Department of Interior. Today the land is under Fish and Wildlife administration, making Vieques the largest national refuge in the Caribbean. The beaches at the Refuge are pristine, clear, undeveloped, plentiful, and surrounded by wild native flora instead of concrete and asphalt and only 10 minutes far away from our Guest House Vieques. This is a place where horses are allowed to roam freely. Crystal clear waters, white sandy beaches, secluded bays… Come and see what true tropical sandy beaches are like. Vieques sports the brightest bioluminescent bay in the world. If there is something you must do during your vacation in Isla de Vieques is to visit the bio-bay and make sure you hire a licensed operator. We have offers if you stay in our Guest House in Vieques.